Sumpter has so much history and so many great archival photographs, it’s been hard to figure out what to tackle next. Surprisingly, turning on the television led to inspiration. There were six episodes of “Ghost Mine” on Syfy channel in Jan-Feb of 2013. Another twelve episodes started airing in early Sept. It’s been great fun hearing behind-the-scenes chatter around town. How deep was that mysterious portal really? What local man carved the Masonic door? Who placed the Masonic rocks? All three answers involve a supposed security guard who makes his television debut in an upcoming episode. (At least I think he hasn’t been on TV before.) A more open-ended debate was which paranormalist was the worse housekeeper: Patrick or Kristen? Anyhow, in the second season’s fourth episode, they touched on the role of Chinese in mining the West. They interviewed Greg Nokes about the massacre of Chinese miners in Hells Canyon. 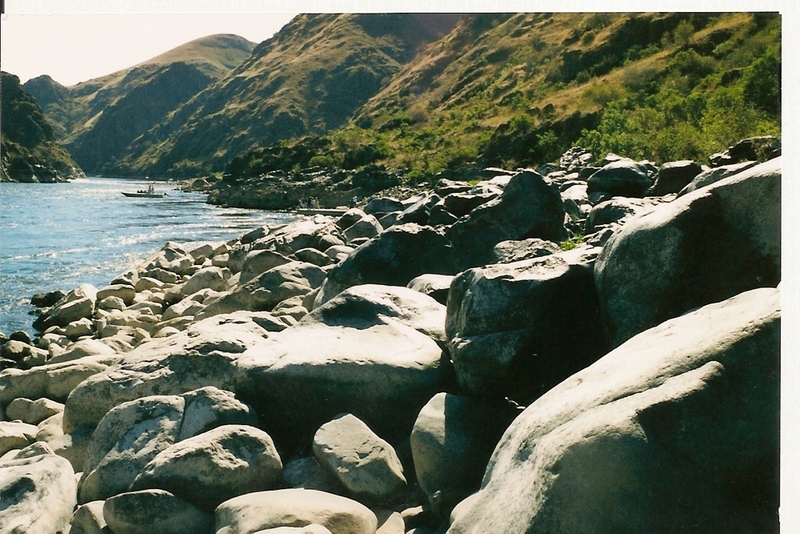 They neglected to mention this Snake River canyon, the deepest river gorge in North America (take that Grand Canyon!) lies on the border between Oregon and Idaho. 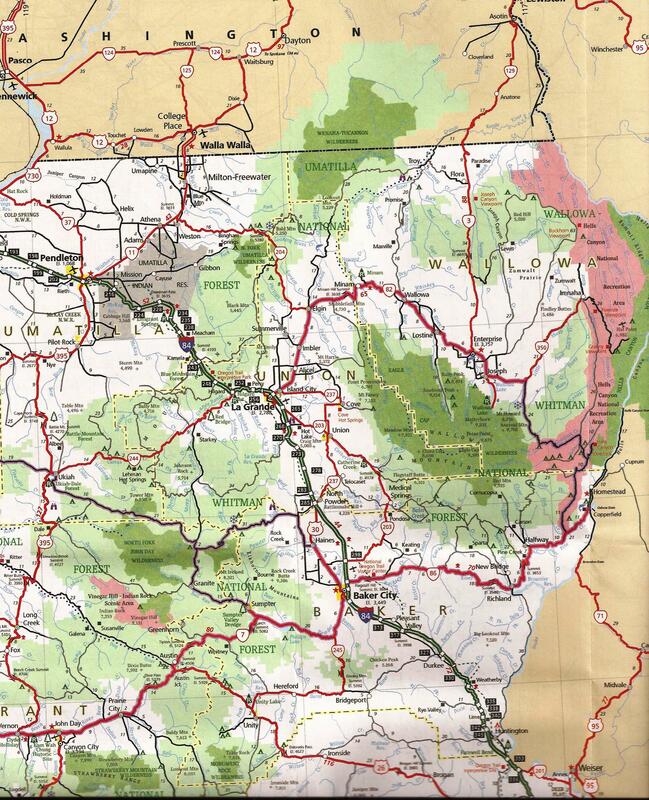 They also neglected to mention that the Snake is over fifty miles due east of Sumpter, as the crow flies. Going up and down the hills between here and there and around through passes in mountain ranges makes the trip by land considerably longer. Couple that with having to swing pretty far north because the massacre took place in Wallowa County—north of Baker County in which Sumpter is located—and the trip’s even longer. This was probably the worst instance of abuse of the Chinese in Oregon, and it’s good that it get talked about. Bit by bit, the Chinese who helped pioneer a lot of our area of the country are getting recognition. I’ve stacked rocks before. If you toss them willy-nilly, the pile gets unruly and in the way in a hurry. If you take the time to stack carefully, the pile stays tidy and unlikely to roll a random rock onto your toe as you walk by. So, how do you get lots and lots of rocks out of the way so you can get to the gold-bearing sand under them? You get really tidy and very, very patient. The walls looked pretty impressive even on my small screen. I’ve been meaning to get there for a look myself ever since I saw them listed on the walking tour brochure, just as I’ve been meaning to visit Kam Wah Chung State Heritage Site over in John Day since I heard of it. 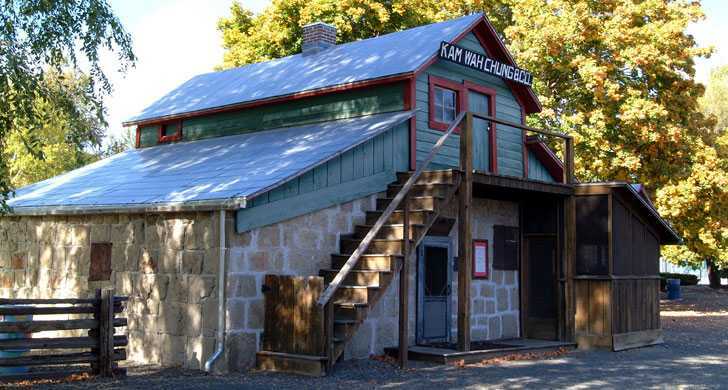 The Oregon State Parks brochure for Kam Wah Chung says, “The museum was built in the 1870s, possibly as a trading post. This tiny, unassuming building became home to two Chinese immigrants, Ing “Doc” Hay and Lun On. Both became locally famous: Lung On as a general store proprietor and businessman, and “Doc” Hay as a practitioner of herbal medicine. For 50-some years, the building was a social, medical and religious center for the Oregon’s Chinese community.” Doc Hay treated Chinese, European, and American patients in his “clinic” until 1948. One of the surest ways to see just how important the Chinese were, though, is to turn to the Federal Census. The city of Auburn—namesake for Auburn Street in the City of Sumpter—in Oct 1861 was where gold was first found in what eventually became Baker County. In the 1870 federal census, Auburn’s population was about 450. Of those, 233 were of Chinese descent, one of them a five-year-old boy born in Oregon. Most of the Chinese were involved in mining, but there were also a doctor, three washerwomen, one male washer, a female domestic, seven traders, and six cooks. Ah, more inspiration. Reading censuses can actually be pretty fascinating. Choices, choices, choices. And when you finish a session investigating the past, you’re soon hungry for more. This entry was posted in "Ghost Mine", Other Area History, Sumpter History. Bookmark the permalink. excellent post…very interesting to dive into historical fact after seeing what the tv show presents as entertainment. While most of us who had to endure a summer of inconvenience are not against the entertainment aspect of the tv show….there are some who are very much interested in maintaining some form of historical decorum and presenting the facts as they really were. if viewers of the tv show Ghostmine would like to learn about the real history of the Chinese Massacre at Deep Creek….this is a great post! refreshing to see real history and information! very interesting – good to see the “real” history! I have a comment from a reader that makes some interesting points about the show itself, but she seems a bit angry and I’d rather not post all of her claims. However, she reminds us that editors and producers define what appears in the program and that the program was only an hour long at a time. She is concerned about the welfare of the miners during shooting. She closes with, “Least you all could do is enjoy the new Tourism that the Ghost Mine will help to bring to your Area. I am Planning bringing my family up to visit soon as well.” I hope they enjoy our lovely area and history.